This past weekend, my neighbor and I went on a self-guided Sustainable Garden Tour sponsored by the Friends of Holly Hill Farm. This was the inaugural year for the tour, which featured several home gardens belonging to the organization's members. 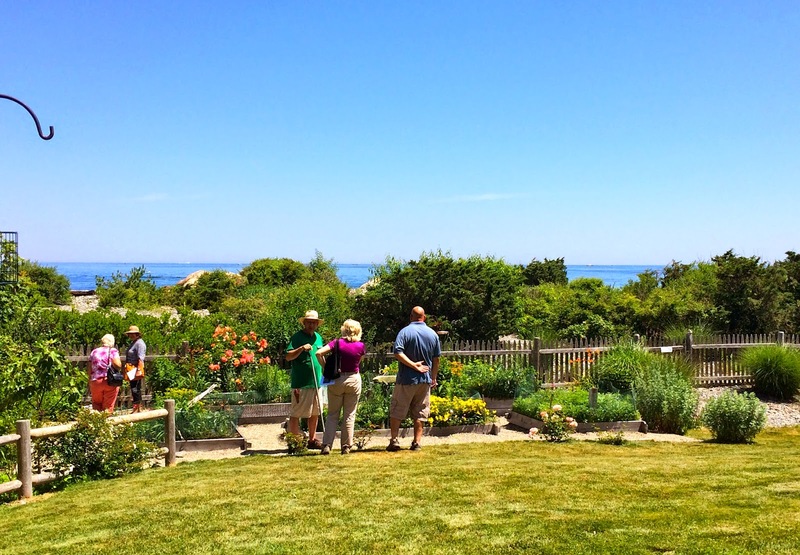 I'd never been on a home garden tour before and didn't quite know what to expect. Nonetheless, I was excited to see what other gardeners were up to in our area. The first home we visited had a beautiful terraced garden overlooking the nearby marshland and shoreline. 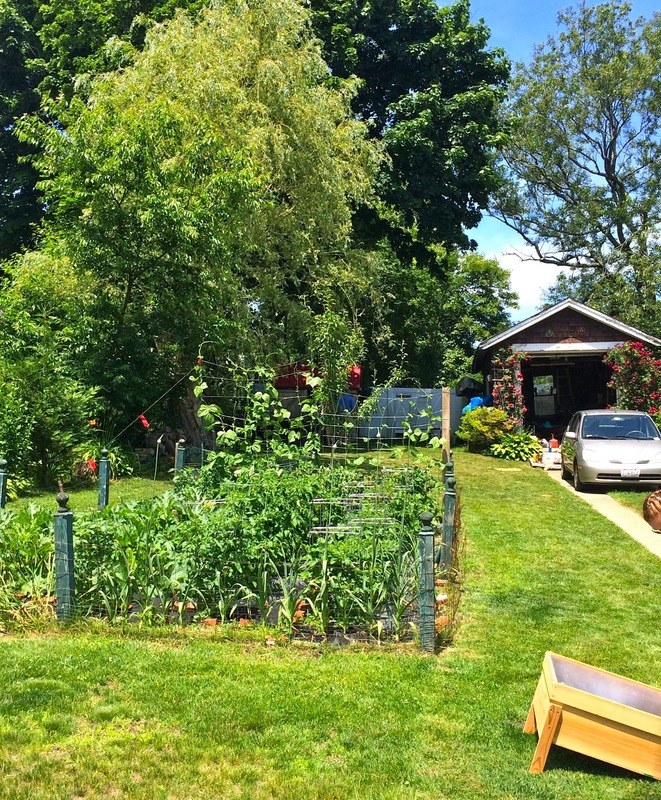 The owner grew a wide variety of herbs, vegetables, flowers and fruit. What I loved most about this garden was its informality. Straight lines were forgone in favor of winding paths that led from one irregular planting bed to the next. Plants of all sorts, whether it be wild or cultivated, ornamental or edible, were allowed to mingle and grow amongst one another. All of us listened intently as the owner led us about. 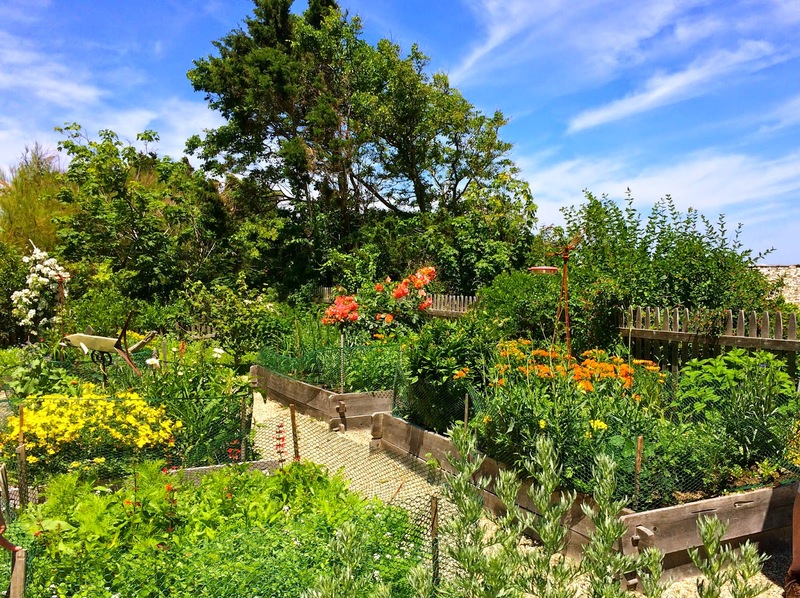 The owner, who grew up in Germany, offered some very interesting and valuable information regarding the medicinal qualities of some of the herbs in her garden. When we left, I made a note to find a book on this very topic. The second home we visited was a feast for the senses. The front of the house featured an impressive rose garden. I'd never seen so many David Austin roses in one place before. 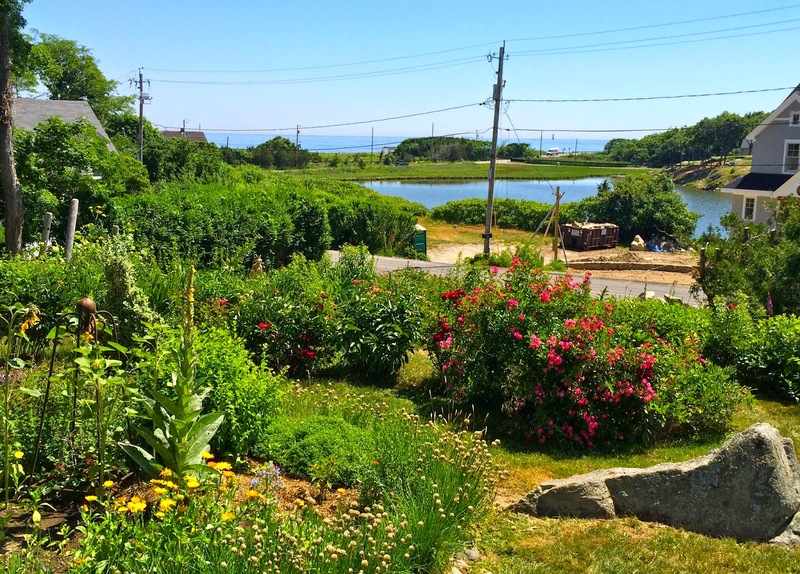 As we made our way to the backyard, stopping along the way to take in the heady scent of two mock orange shrubs, we were treated to a raised-bed cottage/kitchen garden overlooking the Atlantic ocean. ...And vegetables on the other. I loved the raised beds in this garden, which were manufactured by a local business. Unlike the first garden, this one felt much more formal and organized, which I can also appreciate. 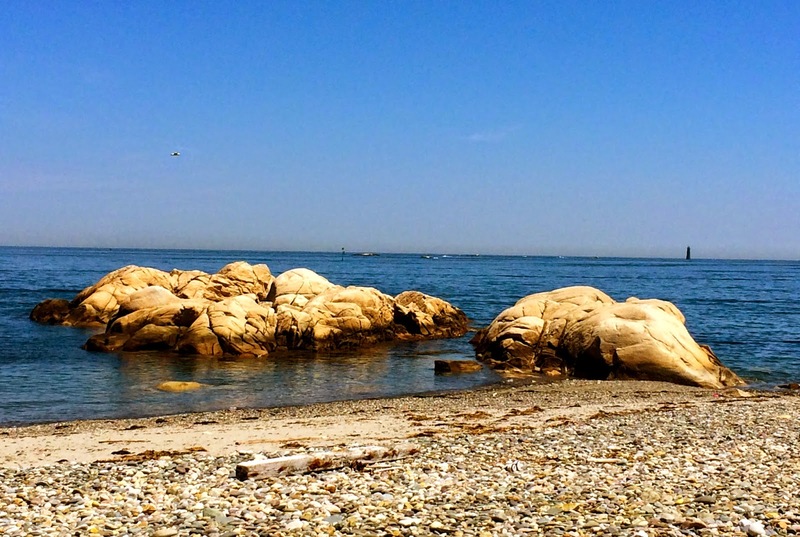 The pea stone, flat beach rocks and ornamental grass mixed together wonderfully to create a simple yet beautiful landscape - all the more appropriate when you consider that the beach was 100 ft beyond the back garden gate. I love gardens that offer up hidden treasures. It wasn't apparent at first, but if you walked a few yards beyond the back garden gate, you were transported to the Atlantic shore. I reckon that it must be quite a challenge to grow a garden so close the open ocean. The owner did mention that the added humidity does contribute to his tomato plants being prone to blight. But this seems like a small price to pay for such an amazing view. The owner was also kind enough to offer me some tips on growing healthy roses, and I left with a note to order more David Austin roses next spring. 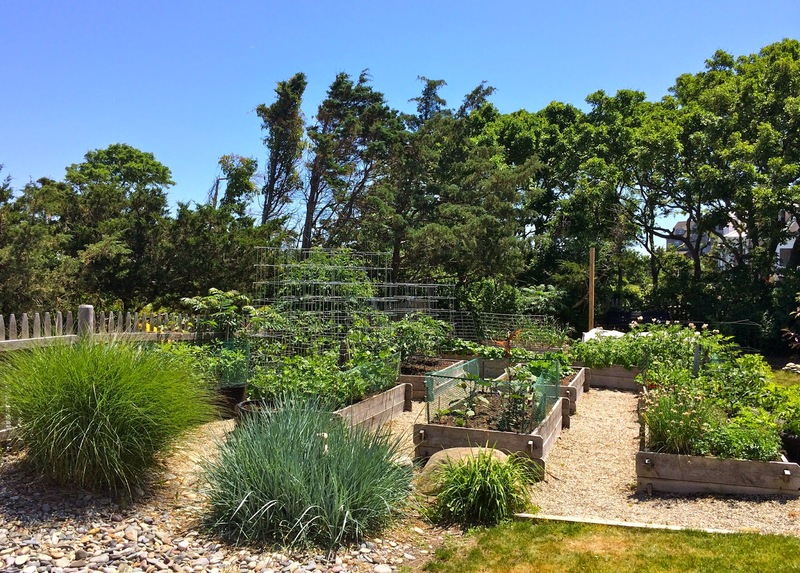 Our next stop was a vegetable garden located in a remote part of the Scituate coastline called The Glades. 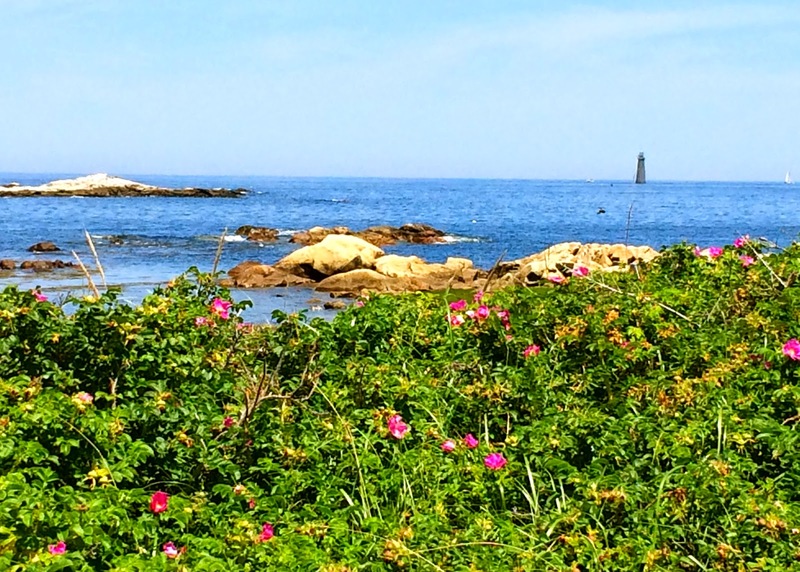 After navigating through long stretches of gravel road, we reached a clearing that offered some of the most spectacular views of Minot Lighthouse and the Atlantic. The small garden was situated on what looked like an old homestead, as evidenced by the out buildings and animal stalls. I couldn't help thinking that we were visiting a place that had its fair share of local history and folklore. The vegetable garden itself was fairly modest, but impressive nonetheless. I could tell that it was being tended to by someone who'd been gardening for a very long time. 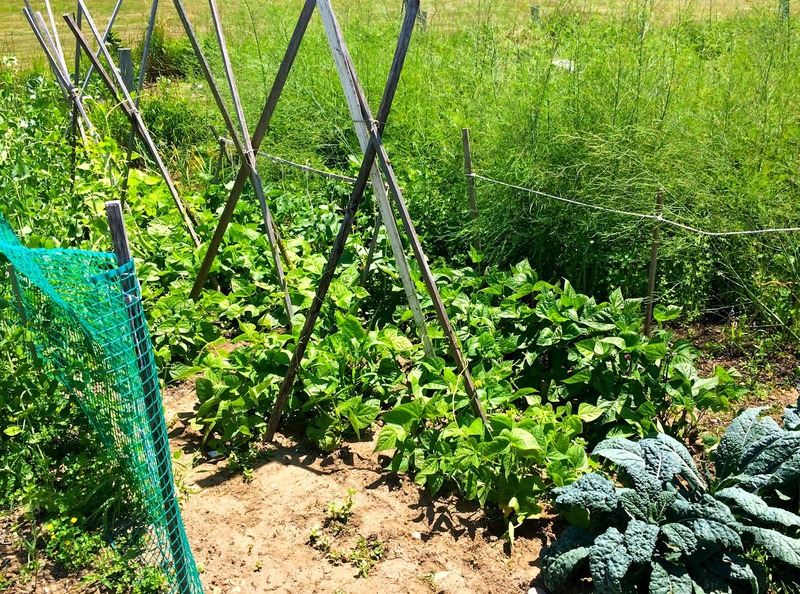 I can appreciate the informal teepee trellises that were erected for the pole beans. 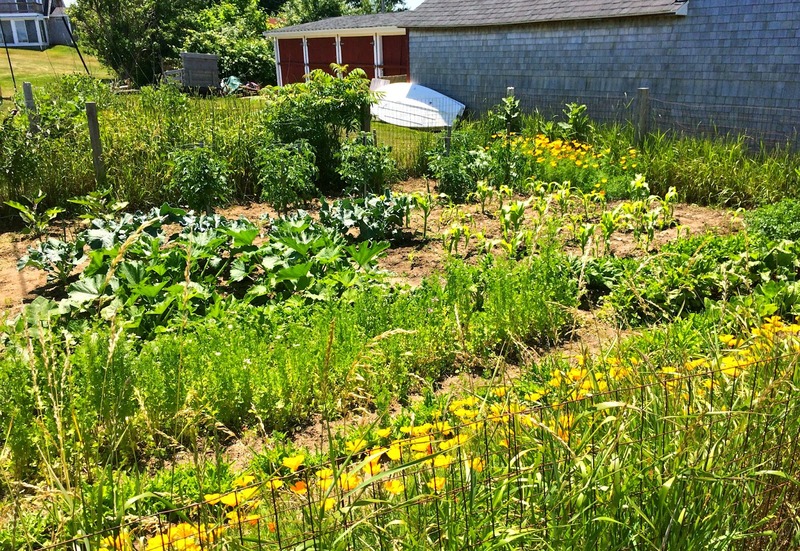 On the other side of the plot were neat rows of squash, broccoli, corn and bolting spring greens. 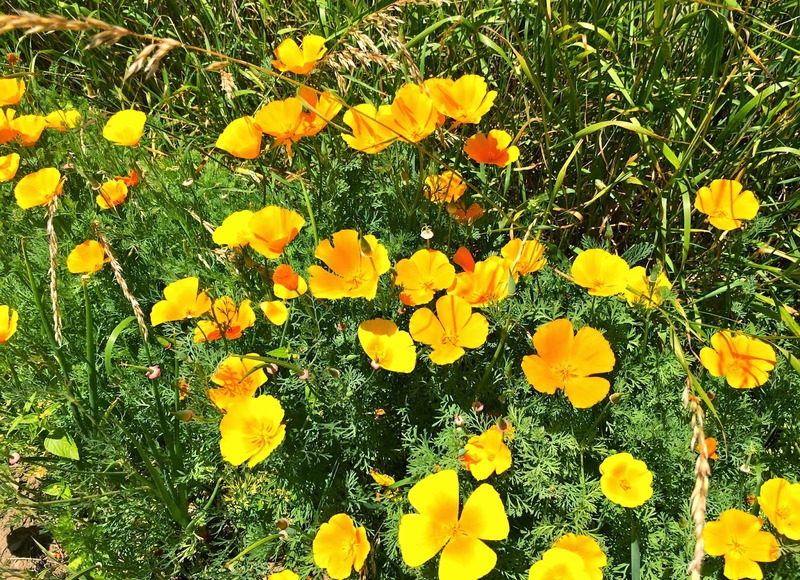 The California poppies, which grew along the garden fence, were quite stunning as well. The owner direct seeded them this past spring. I made a mental note to order some seeds for next year. What I found most impressive about this garden was its unique "terroir" for lack of a better word. 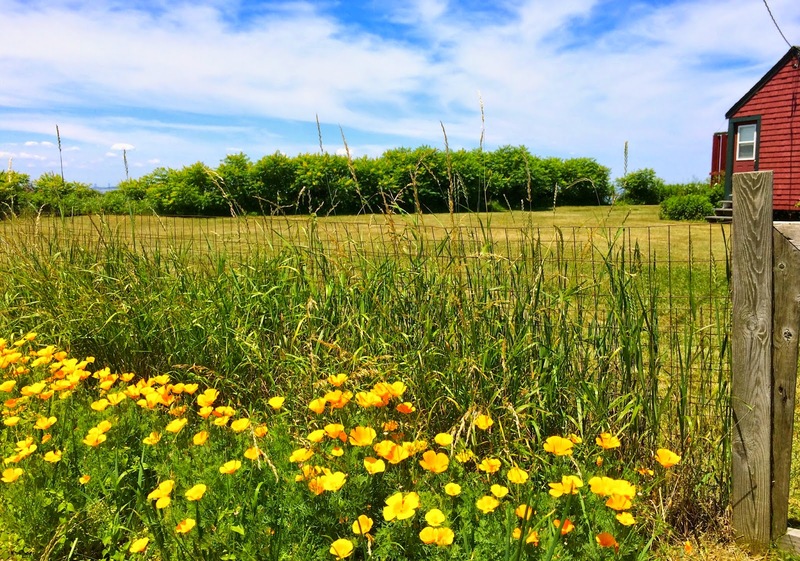 It's a garden situated within an expansive seaside meadow and subjected to frequent salt spray and the mighty ocean winds - conditions that would present a serious challenge for even the most experienced gardener. And yet the garden still thrives under the care of someone who appreciates the act and art of growing things. The final home on our tour featured a wonderful vegetable garden that was prominently displaced on the front lawn for all to see. 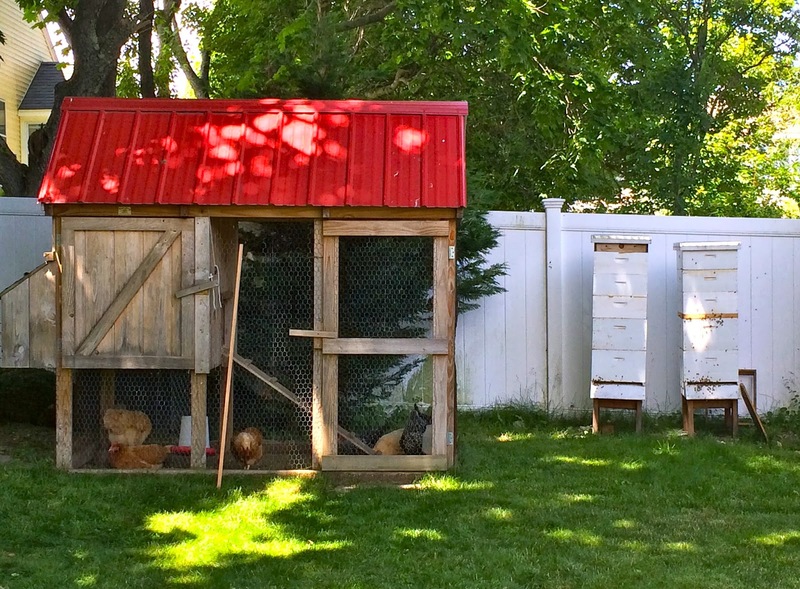 In addition to this, the owner also maintained chickens and honey bees on a relatively small plot of land. On the bottom right hand corner of this photo is a solar wax melter. What I loved most about this "homestead" was that it proved you don't need a large amount of land to become more self-sufficient and sustainable. 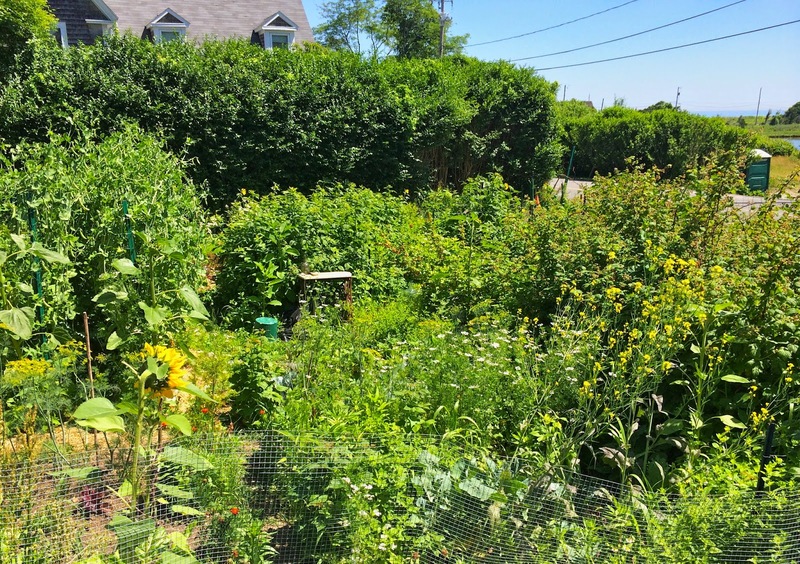 The chickens supply the family with fresh eggs and amendments for the garden, the bees provide honey and wax for making balms and candles, and the garden feeds the family and provides a habitat for beneficial incests. We left the tour inspired and excited to integrate some of what we'd learn into our own gardens. It felt nice to chat with other gardeners, and along the way, meet local folks who share a common interest in such things as gardening, good food, animal welfare and sustainability. Gardening can feel like such a solitary vocation at times, which is actually one of the things I love most about it. On the other hand, sometimes you just have to walk beyond your own garden gate and explore the community around you. You'd be amazed by what you might find. I always wished our town had tours like that. I get glimpses into my neighbors' backyard plots but I can't see them well. Well some I can, but most are tucked in the back where I can only tell they are there, not what they are really like. What a fun day. Each of those gardens is unique and has its own personality. They are all beautiful and it's fun that you found something in each of them to inspire you. What a beautiful part of the world you live in. What a great tour! It's great that so many people near you do so much gardening. Sadly we are the only ones in our neighborhood that do gardening, vegetable and otherwise. There is a woman that lives in the adjacent development that works her yard too and we've been invited up so I may go see her tomorrow. Wow. So neat to see other gardens and great for ideas huh? You know, in a city like we live in, when in town, not the farm, Houston, millions of people, you'd think there would be a tour like that. Nope. They have "home and garden tours" but I've never seen one that includes veggie gardens or bees or chickens or anything like that. I should see if maybe there is something I've perhaps missed. Thanks for sharing! Those are some beautiful & inspirational gardens. I have wanted to go on a garden tour for some years, but just never got around to it. I'm sure once I do finally go on one I will wonder why I hadn't done it before. Thank you for snapping the photos to share with us, those are beautiful gardens and such pretty area of your community.